I thought I'd post a separate thread about this with it being a totally new layout to avoid confusion during comments in the thread. A few things about the last layout irked me and so I've done a fresh layout which ended up 1 column narrower and so makes it less tight in a 1590B. There are also less links required, includes the reverse polarity protection diode and supply current limiting resistor found in the original but which I omitted from the first layout, and makes better use of the space IMO. Anyway, now you can make whichever layout you prefer. This very mild overdrive was inspired by an old Supro amp, there is special kind of warm mild overdrive that you can't find from any other amp (or pedal what so ever). Works very well with other pedals or distorting amp giving this fat and warm overdrive character. The pedal is also super dynamic, from clean to overdrive just by using different touch of your hand. i was actually really surprised how good they sounded together in gearman's vid. making me rethink my rig now haha maybe dial back the gain on my amp, run the klon for regular drive, kick on the honey for even more. Sorry but, the "Drive 3" where i have to connect? You don't have to, it's being used as a variable resistor so only two lugs are connected. You can link it to lug 2 if you want to, but it isn't necessary. The D5 component is not explained...what kind of diode can i use? Will 33K resistors work in place of the 31K6. From looking at the schematic I thought they were used just in a voltage divider to bias the opamp, I wonder why they made it with the exact value. To make it more awkward to clone for people with OCD like me who have to have everything exact! :o) Yes there's no reason why not to use 33K instead, I have done before when I've built a Honey Bee and there was no difference. I built this today, works like a charm and sounds fine. As i (almost) always do, i read the HB-thread on fsb and found a nice mod for all of those who think, this circuit lacks some treble: up the 4n7 cap at the nature3-lug to 47n, this gives a tad more overall clarity and a nice treble boost with the nature pot full cw. Also i found the bass too flabby with nature full ccw, adding a 1k5 to 3k R in series with the nature1-lug works fine for that...;-) enjoy! Mark, please help. I have finally gotten this thing built. First build and took about 15 hours, 5 2nd degree burns, 1 ruined favorite shirt (don't ask), and 2 solder fume migranes. I have checked every connection and location about 15 times, but still nothing. I've made sure each vero track is isolated and not touching othr tracks unless called for. The parts are pretty much exacting to the list. I have checked each track's continuity as well as the points they lead to. Problem is I have no effect coming out whatsoever when turned on. When on battery I do get my LED, but on 9v there is none. When off it is normal True Bypass. I have the footswitch ground going to the sleeve of the input jack and the 2 board grounds and the 2 pot grounds going to the sleeve of the output (mono) jack, Although I could probably do a better job on that solder job. However when wiggled, still no signal from the board, just loud pops. No idea where to go from here and I'm about to pull my hair out at this point. Just post anywhere (google+, tinypic, imageshack, whereever) and post links here. Found 1 shortcut and 2 bad solderings. It works! Thanks for a great layout and good build guides! I've looked im totally new to these diagrams so im finding it hard to understand. If it showed the pots and the input and output parts with wires leading onto the circuit it would be allot easier. Also at the bottom it says volume 2 to output in the picture there not on it so i dont know what id have to do. Yes, it would be easier for you if we were to draw the pots on layouts. No denying that. "Volume 2 to output" means that you'll have output at volume pot's lug number 2. So you'll connect that with a wire to your bypass switching as the output. so where is the output on the circuit? Really. I'm sorry. I'm totally new to these diagrams and this is also my first build. It says pretty clear in the layout - "Volume 2 to output". And i've answered this same question above. Volume 2 is your volume pot's lug number 2. Welcome Ricky. Hope me and Ksenagos didn't come out as too cynical folk, but it really has that information on the layout. If you think about it for a second, you'll figure it out. i STRONGLY recommend to carefully read these things. so...do you have everything in frond of you? or you just want to know more about this layout? well...if you have all components like transistors, ic, wires, resistors diodes, caps, led, and potentiometers, you're ok.
for this layout, the output of the effect, comes from the middle leg of your volume potentiometer. Yup. I would recommend something a bit less complicated for a first timer too. But. Debugging skills are very important and what's a better way to develop those than to build something hard. but just yesterday i had to put a sho after a phase90 with volume drop problems, and i've put the 2n7000 the wrong way!somehow i've wrote the pinout from beavis audio the wrong to the case sticker...debugging is hiding everywhere!! even in your own boxes! Thanks, for the reply. If I hadn't almost finished the project I think I would indeed try a less complicated circuit. I managed to cramp all the components in to a Hammond 1590a which was a pain to do. As you can see, from the top right lug on the 3pdt the wire goes to the output on the circuitboard(or the otherway around), but I can't figure out where the ouput is on the board of the Honey Bee.. It doesn't say. Outpout doesn't need to come out of the board. It can, as well, be coming out of a lug of a potentiometer.. Like i said. If you think about it for a while, you'll get it. I got everything working out but I only get unity volume when I crank the volume pot. I presume it's not supposed to be like this, any ideas? I used 1N4001 as D3-D5. I haven't substituted any values as far as I remember. You could try to probe it to see where the signal goes quiet and trace that area. It could be just one component misplaced or tiny short at one perfect place to cause the behaviour..
Yeah, figured I'd try probing around next. No shortages in the copper stripes, checked that with a multimeter but there still might be some component legs / jumpers touching something they shouldn't. Ok, I think it was just my Amplug toying with me. I tried it with the 5w Blackstar and it definitely had a volume boost, not much but enough to drive from AC/DC to 80's hair metal with the gain at zero and volume at 10. It was overall quieter than my TS808 with 47n input cap and 100n HPF. The amount of drive does not seem to affect the overall volume output at all, at least when to volume is already cranked.. Does that seem right? At least it sounds pretty good! Just built one myself.. It is quite low on output level. Puzzles me. I think it should be louder. I don't think gearmandude is playing below unity on the demo. It should definitely be well above unity. I can't remember if the last one I built was the newer or older layout, but it had plenty of volume. So. Replace the 47K at the Vol 3 connection with 4K7 (or lower) and swap the 2N5457 for J201. Unity at volume pot at the middle with humbuckers. 47K in there may help a bit. Not much. But i can't tell since i've swapped the output resistor and the JFET already. However. 47K seems like it gave me a bit more sparkle to the tone. Slightly brighter and not as muddy. Yes I reckon there must be a couple of versions of the schematic knocking about. I just checked the Bearfoot and it definitely has 150K but that doesn't fit in with the Honey Bee scheme I just looked at. I found a pic and the last time I built this it was the first version which has always had a 47K in that position and as I said that I was well above unity. Yes. Miro updated me on this, thank you very much for that. I asked my already sold build to be shipped back. Turns out the owner loved it and had pulled it out of a sale and put it back on his board. He was still interested to see how it turns out. As he liked the tone, I didn't mess out with the output section. Swapping the 147K resistor for a 47K increased the output by a mile. The output is now pretty normal for an overdrive. The sound didn't change much or at least I didn't notice anything drastic. It's a pretty sweet low gain OD. I think I actually like this better than the sweet honey overdrive. On the other hand, i do believe they use matched JFETs at the output, so to get the most out of the circuit it would probable be the best to tweak the value of 5K6 drain resistor. Hi IvIark, I have finished my 1st build, but it is a bit weird. First of all, the last 10% CCW turn of tone knob causes an increase in gain although it can lead to a darker tone. Also, when I turn the gain knob at minimum, it leads to a drop in volume. Does any one has the same problem? Hi IvIark, I noticed you left out the zener diode that appears in the original, but it is just polarity protection, right? Bjorn uses a zener as part of the LED circuit but I really can't see much point in over complicating something so basic unless I have the room to do so, so it's normally the thing I omit from his circuits. That's Bjorn's way and he does it every time in all the BJF and offshoot effects, and no doubt he's forgotten more about electronics than I know, but I'm still never going to include it if it means I'd have to add additional rows or columns to the layout. I'm having some trouble with this build, and I might have narrowed it down the the IC and the transistor. With an audio probe I get signal on pin 3 of the IC, but no signal anywhere else. Could that be a faulty IC? I'm using a CA3130EZ from Tayda... is that the same as a regular CA3130? When I remove the IC and run a jumper from pins 3 to 6 on the socket, I get signal until G on the transistor, but then it is gone. No other pins on the transistor have signal; is this normal? I didn't have a 2u2 cap so I ran two 1uf in parallel, the second sitting in the holes to the left of where the 2u2 would go. Should I have soldered them together rather than have them in adjacent holes? Thanks in advance for the help! I've been troubleshooting this one for awhile. Just checked voltages and they don't seem to read the same consistently. They're also different depending on if I use the ground on the power jack or the ground on the output jack. I am supposed to touch my black lead to ground and my red lead to the pins, right? Well if you're not getting around 9V on pin 7 of the IC then it definitely isn't going to work so that's the first thing to fix. That's connected to the supply so you need to find out why the 9V supply isn't reaching the opamp. A bad solder joint on the 9V wire or something like that may be responsible, or maybe a faulty or incorrect orientation D5 diode. Or maybe the value or soldering on the 51 ohm resistor. Thank you! Thank you! In trying to figure out where the 9v wasn't making it through I found out that one of the + terminals on the power jack wasn't getting any power and that was the one going to the board. Once I fixed that it worked great. I'll be checking that first from now on. Thanks!! Any more news on the weak volume control? I'm actually having the same problem myself. Glad to know I'm not going crazy, but it's also proving to be a huge pain in my hind parts. I love this layout!!!! It works awesome. Thank you for the hard work. 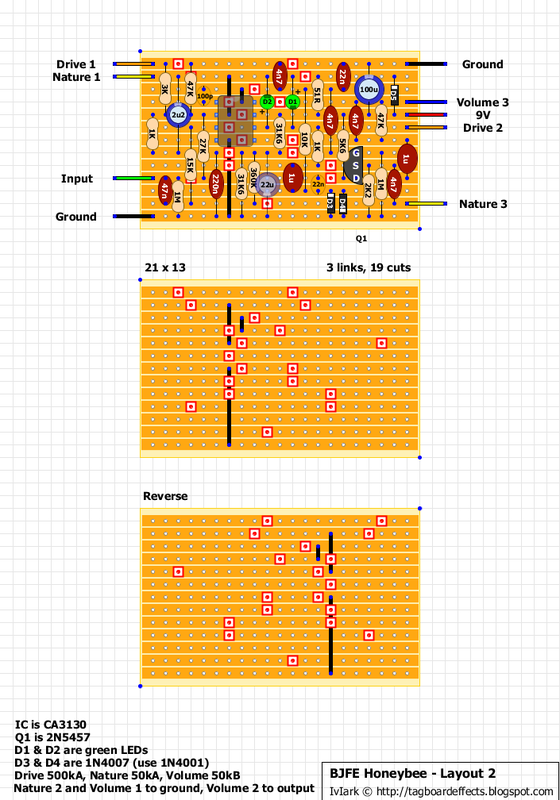 Hi, I'm building this circuit using the Bitzbox kit. I have a 1uF Ceramic and a 1uF Polybox caps and I'm not sure which one goes where on the board. Any advice? I can't build anything properly lately, I've had all kinds of strange problems... This one works and sounds really nice at low gain. When I turn the gain knob above noon, there's a high pitch squeal that increases in pitch as I turn the gain knob up more. Just wondering if anyone has experienced anything similar? Tried a few 5457's, unfortunately I only have one 3130 on-hand. Sorry, if it wasn't obvious, by gain I meant Drive. The information which you have provided is very good. It is very useful who is looking for Shilajit Capsules. This is my second pedal build but the first one with an IC. Which way does the chip go? Is pin one supposed to be the top left? If you look closely at the IC in the layout you can see a light shaded semi-circle on the top. You're IC will have the same semi-circle or a dot. This denotes where Pin 1 is. So in this case Pin 1 is top left. I couldn't see that semi-circle on the layout without zooming in on the web page. Thank's for the help! Where should I use the polybox and where the polyester film ones or does it matter? I need an help from you guys to debug my unit! I'm not getting any sound out of it, checked audio connections, pin D on fet reads about 9V, now in IC I have 8-9V in each pin... is it ok? I get a clean guitar signal till IC pin 3 but then I should hear sound out of pin 6 but nothing! Something's badly shorted if you have supply voltage on all IC pins. Pin 4 has to be at zero as it's grounded. Are you sure you have both of the two ground wires connected together? Help! My build sounds awesome 8-10 seconds, then it's like the drive section switches off: volume drop and no clipping. I tried several different 2n5457's with no change. I don't have an extra opamp to swap out, is it worth ordering a few or does someone have a suggesting of something else to investigate first? Additionally, cranking the gain or turning down the nature cause it to switch off faster. is there anywhere that has the complete wiring diagram, with switch and pots? im keen to try this pedal as well but without the offboard bits its complexing. ive seen two different ways alreayd to wires the footswitch and im sure on has to be more correct than the other. hey man. you're really not going to get a layout the way you're asking because it takes a lot longer to make the layout, and some things are typically always the same. if you look at the layouts here you'll see all the info you need to wire up the pots directly on the layout. i'll explain using this layout as an example, especially since you're looking at building it. lets start with the pots. on the layout you'll see colored lines, which represent wires going to offboard components, and a descriptions as to where they connect. on this layout the blue wires are for the volume pot, the orange is for the drive pot, and yellow for the nature pot. if we look at the orange wire on the left side of the board it's labeled drive 1, which is telling you that you're going to connect a wire from that location to lug 1 of the drive pot. the orange wire on the right side says drive 2, meaning you'll have a wire from there to lug 2 of the drive pot. you'll notice there's nothing that says on the board or in the notes at the bottom that tells you about drive 3, meaning that you'll leave lug 3 of the drive pot empty. you'll follow the same steps with the nature pot and its wires, but you'll notice something different about it. in the notes at the bottom of the layout it says nature 2 to volume 1 to ground. this means that you'll have a wire that'll connect lug 2 of the nature pot to lug 1 of the volume pot, and another wire that will connect volume 1 to ground. you'll use this for any pedal that you want to wire true bypass with a 3pdt. so since it's always the same you're not going to see it on any of the layouts. just follow connecting the wires to the appropriate locations indicated on the offboard layout. one thing is that you'll notice on the offboard layout it shows the output from the board coming directly from the board, but in many cases the output comes off of lug 2 of the volume pot. so just follow the build notes on the effect layout to see where your input and output wires are coming from. it will really help you figure out how to wire everything up. Hello people! I built this one up yesterday and it appears that it's working as expected in that all pots work and you can hear the overdrive effect but the volume when engaged is very, very low. I've looked over the board over and over and re-flowed solder on any suspect joints and gone over all the other connections in the enclosure and I'm not seeing anything. Next step is to bring out the audio probe or just try and build it out again. Wondering if this sounds like something that might be a quick fix. Ripped all the components off and built out again and it's working. Not sure what I missed the first time around. Hello! I need some expertise here.. I assembled the pedal about three months ago, and left the project behind, but now I really want to finish it. 2) The BIG problem.. The pedal oscillates when I turn up the gain. also the gain structure itself seems a bit "off".. When the gain pot is set to about 30% the oscillation i apparent, and more so if the gain is increased. The pitch of the oscillation follows the gain pot, and goes from a mid freq hum and lowers in pitch as the gain pot is turned all the way up . The pedal sounds almost like a ocafuzz of some sort, but useless as the hum/oscillation is constant. This layout sounds great! I did as Heiko Hafner suggests above and switched the 4n7 on nature 3 to 47n and much prefer the sound now. I have built the Bearfoot version too but like this one better. The other thing I have done is reduce the 2u2 cap to 220n as it had way too much low end with the nature pot left of centre in my rig. Just curious - I wonder if i could separate each side of the nature pot? IE have a separate bass pot and treble pot. That could be cool. I put this together a few years ago. The pedal sounds great, but is extremely compressed and lacks any push or volume. As a result I shelved it a while back. I'm wondering if I may have not properly biased the JFET. My drain voltage is reading at about 6.8v, should I increase the drain resistor get the voltage closer to 4.5v/Vref so as to allow for more swing in both directions? Would this possibly help me with my volume issues? I'm not an expert, but know just enough to be dangerous, so any help would be much appreciated! Finished it and working great !! For those who have some issues with the volume output : check the drain Fet voltage ! I'm a little late to the party but...is the image above the only source available for assembly of the Honey Bee? When I open it, the image seems a little low res to print out. Is there a schematic buried in another post somewhere? Like "Layout 1" or something?